These tender, fall off the bone ribs are sticky, sweet, and tangy with a hint of spice. They're a sinch to make and will have your guests begging for more. If it hasn't been done already, take off the membrane from the bottom side of the ribs. Mix all the ingredients of the rub together into a bowl. Sprinkle the rub on each of the ribs and rub it all around so that all parts of the ribs are covered in the spice mixture. Place in a large covered oven proof dish. 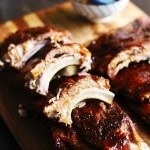 You can cut the rib racks in half or in smaller pieces. Cook in the oven at 300 for at least 2 hours or until the meat is very tender. In the meantime, make the BBQ sauce by adding each of the ingredients to a bowl and whisk to combine. Get your BBQ heated to about 350. Remove the ribs from the oven and give them a first coat of BBQ sauce while they are hot and you are waiting for your BBQ to heat up. Place ribs on the BBQ and keep turning and basting with the sauce until the ribs are well coated in sauce and have some crispy bits on the edges. Remove from the BBQ and serve! Make sure to have some paper towels and finger bowls handy! 1 - The rub recipe will cover 2 - 3 racks of ribs. If you have more ribs, you will need more rub. The sauce recipe would be enough for 4 racks probably. 2 - You can also baste the ribs with the sauce and broil them on low in the oven if you don't want to use the BBQ.